A friend asked Duc and me for a double date one night in December once his long-distance girlfriend made it into town. 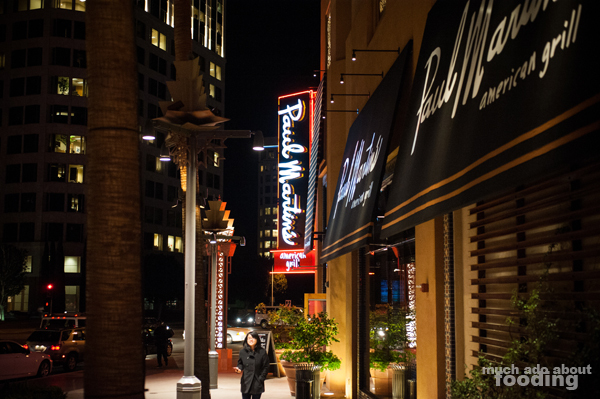 Asked for suggestions, I thought of some of the restaurants that were at the To Live & Dine event a few months prior hosted at the OC Mart Mix and Paul Martin's American Grill was one of them (a $10 VIP card is a good incentive too). So we decided to meet there, mistakenly on a Friday night. The parking was more than a little crazy but we finally made it. What I like about this place is their motto of "Eat organic. Believe in sustainable. Buy local. Love fresh." The influx of this type of focus in eateries lately has proven to bring out great food and great commitment to a local (and also global!) community. Their menu showed their featured produce for the season and some facts on the food. 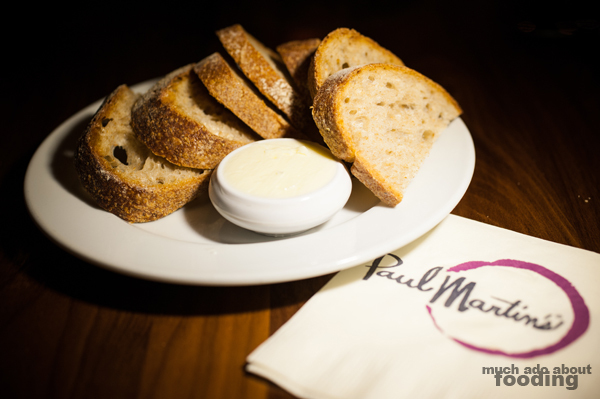 We started off with some bread and what tasted like housemade butter - a delight. I ordered a dirty martini and was disappointed in the general customer base that my waiter had to ask vodka or gin; gin of course! It was a strong drink but good. 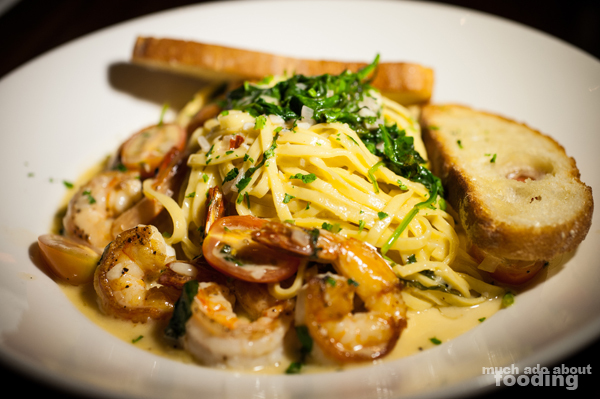 The couple we were with ordered the Wild White Prawns & Fresh Linguine (prawns, tomatoes, spinach, garlic lemon butter) and Pitman Family Farms "Brick" Chicken (free-range chicken, mashed potatoes, herb jus). I had a small taste of both and can definitely place my favors towards the latter. The prawns were a tad overcooked in the first dish though the sauce was quite tasty. 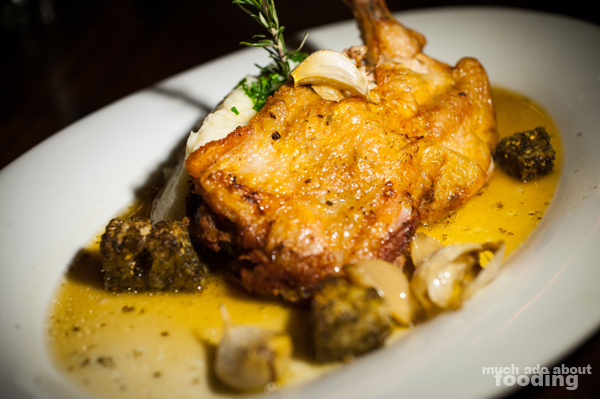 For the brick chicken, the restaurant managed to get a perfect crisp to the chicken's skin and a tenderness you don't see often in this white meat. Great execution on that dish. 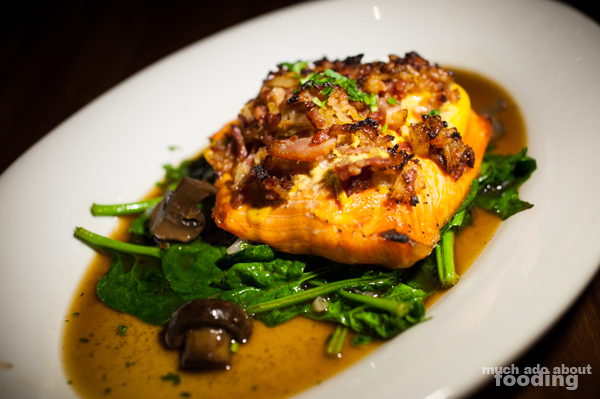 As for us, we opted for the Cedar Plank Salmon (shallots and bacon, organic bloomsdale spinach, crimini mushroom jus) and Grilled Polenta (housemade, sautéed seasonal vegetables, tomato cream, fresh Parmesan). Look at us trying to be healthy and such, hah. The salmon was tenderly flaky and just a tad smoky enough to get a whiff of the cedar. The crimini mushroom jus nearly erred on the side of being salty because of the shallots and bacon in the dish but the spinach nicely topped off the flavors and steered them away from the potential sodium-y threat. My grilled polenta was spot on in terms of texture. 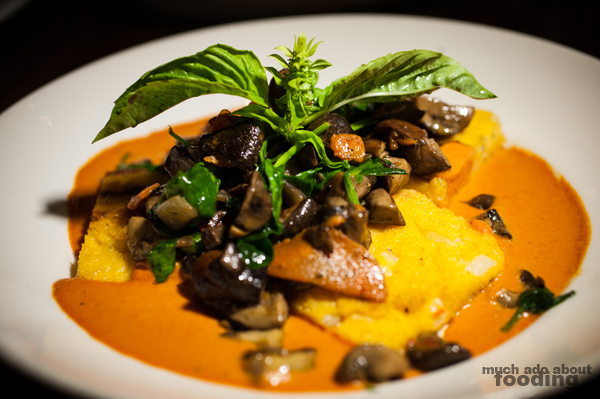 The tomato cream was smooth and a perfect blend alongside the mushrooms and spinach. I found the evening's fare to be fantastic and would think to come back, especially considering the restaurant's general philosophy!